With the turn of the season quickly approaching, I think it's a good time to be doing a little extra cleaning. And where best to start than with the face? My combination-slightly dry skin veers more towards its combo side during the summer, which means my T-zone is a little extra oily. Now that it's nearly the end of summer, I thought it'd be a good idea to scrub all of the gunk out of my nose area before my skin takes on a drier state and blackhead treatments become a little too harsh. I've used those Bioré pore strips in the past, but I've found them to be ineffective in that it seems blackheads form even more quickly after using them. That's a big no-no in my book. And me being me, I looked around at blackhead reducing recipes I could make using common kitchen ingredients. Well, I found quite a few ingredients and I've tried all these recipes all out. And now I'm going to share them with you. Mix together 1 tablespoon of clay and 1 tablespoon of apple cider vinegar to form a spreadable paste. If you find that the mixture is too thick, you can either add more vinegar or a little bit of water. Be wary of adding too much vinegar, as if will have an astringent effect. Apply to areas where you have blackheads for 15 to 20 minutes. Apply a warm and wet washcloth to the clay until the clay softens, and wipe to remove. I didn't think this would do much, but it definitely had a slight stinging effect and tightening! Apple cider vinegar is commonly used as a natural astringent and it's said to be antibacterial. It's also supposed to help minimize pores, so that's an extra added benefit of this particular mask. I did notice a little bit of redness around my nose after removing the mask, and generally clearer pores, though it didn't get all of the blackheads in the "creases". I would think that a thinner mask would do a better job of this in the future. Mix about a half teaspoon of baking soda with 2 to 3 drops of tea tree oil. The texture will likely be very powdery, so add about a half teaspoon of water to it to form a spreadable paste. Wet the area you want to remove blackheads from and apply the paste. Use the paste as an exfoliator, rubbing it in circular motions over the area. Rinse off. There's some controversy over whether baking soda should ever be applied to the paste, since it causes chemical reactions. For that reason, I wouldn't recommend this for sensitive skin and you should always be careful and test it on a patch of skin before applying it your face. That said, baking soda has a fine, gritty texture that's well-suited to exfoliation, and tea tree oil is a natural antibacterial and is often used to help control oil and acne. Since I'd only recently tried the clay and vinegar concoction on my nose, I didn't have all that many blackheads to test this out on. It wasn't superb at removing the blackheads in the "creases," but this was less chemically abrasive feeling than the clay and vinegar mask and felt like a good exfoliant. The instructions really depend on how gritty an exfoliation you're looking for. 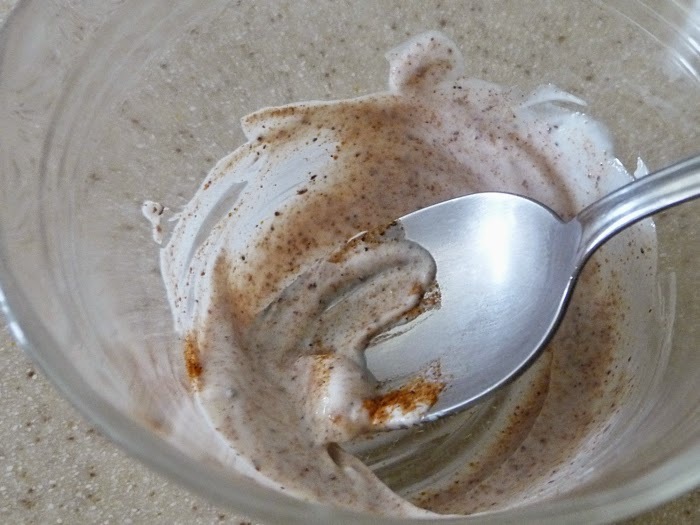 If you want a really gritty texture, mix one part yogurt and one part nutmeg. If you have more sensitive skin, aim for two parts yogurt and one part nutmeg or even three parts yogurt to one part nutmeg. As with the baking soda and tea tree oil mask, apply this to the blackhead-ridden area in a circular motion and rinse off. This was amazing and by far my favorite of the three masks. The scent was very heavy, so if you're vehemently opposed to the scent of nutmeg, stay away from this one. The lactic acid from the yogurt will help break down dead skin cells and the nutmeg serves as a perfect exfoliant. This removed a ton more blackheads I didn't even realize I had! If you have sensitive skin, be sure to use less nutmeg as the grittiness is pretty intense and therefore good at cleaning out the pores. What's your preferred method of removing blackheads? Do you have any tried-and-true remedies?